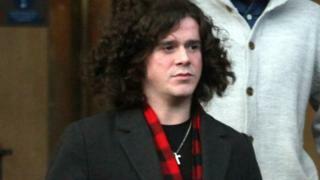 The View singer Kyle Falconer has been fined £1,000 for an air rage incident on a flight from Spain to Scotland. A court heard that the Dundee musician's actions in June 2016 led to the Jet2 flight being diverted to France, where he was arrested. The 30-year-old admitted the charge at Paisley Sheriff Court. The airline has banned Falconer for life and charged him £14,000 for the cost of diverting the Jet2 flight to Nantes. The court was told that the incident happened on a flight between Reus Airport in Spain and Glasgow International Airport. Falconer was told he would be unable to sit beside his fiancee Laura Wylde on the flight. The court heard that Falconer had to sit in front of Miss Wylde and repeatedly spun around to talk to her. He then banged into the woman next to him, spilled his drink over her, and confronted her husband. He then shouted and swore when asked to behave, before calling the cabin crew member a homophobic insult. The flight had to be diverted to France to have Falconer removed, at a cost of £14,000 in extra fuel costs, compensation for passengers who missed connecting flights by the two-hour divert and other airport costs. Claims he had threatened other passengers while in possession of two bottles were dropped. Defence solicitor Ian Houston said: "This whole event has cost him £25,000, money he doesn't have and will have to work hard to pay back. "I can't say, and neither can he, what happened to the money he must have earned. "He is deeply ashamed of this, especially the homophobic remark, given he has friends and relatives who are gay. "He just wants to get on with the rest of his life." The court heard friends and family had helped Falconer pay Jet2 the £14,000 diversion bill. Falconer checked himself into the Lanna Rehab centre in Thailand following his arrest. Speaking at the time of the incident, Jet2 managing director Phil Ward said: "Kyle Falconer may be a rock star but that is no excuse for such abusive behaviour. "Many of the passengers on the flight were families and he showed absolutely no respect for their safety and wellbeing, which is why the captain was forced to divert the flight."